So, it says here in the above passage, that when “ye…shall see the Abomination of Desolation standing in the Holy Place”, those who are in Judea should flee to the mountains. But is this where we should flee to? Or is there a deeper meaning to this passage? The fact is, the Bible is a spiritual book, and the Bible plainly says, “Which things also we speak, not in the words which man’s wisdom teaches, but which the Holy Ghost teaches; comparing spiritual things with spiritual.” 1st Corinthians 2:13. God has purposely hidden many truths in the Bible by simply speaking in metaphors. Yes, the Bible is filled with many parables, or allegories. But now God is giving a message written in the heavens. And yet, that heavenly message only directs back to the Bible. And this article will explore the heavens, that the heavens may declare, just what the Bible has to say about this very important warning. So come along, and see if these things are not in harmony with the Bible. These two passages reveal that Satan (the “mystery of iniquity”) wasted no time infiltrating the Church, right after Christ’s ascension. So let’s take a very short look at the history of the Church, and see just how this “mystery of iniquity” has been working through history. Now after Christ’s ascension, persecution against Christians began. The Roman government as well as the unbelieving Jews both began to make life difficult and sometimes even bloody for Christians. But around 320 A.D., the emperor of Rome, Constantine (see this painting), had a change of heart, and began to embrace Christianity. And while peace is nice, this embracing of Christianity by the Romans had its deleterious effects, in the form of worldly compromises. False doctrines and pagan celebrations were gradually introduced into the Church, causing the Church to grow in creasingly corrupt, ultimately becoming desolate of God’s Spirit. Rules and ceremonies replaced a faith-filled communion with God and the love for the Bible. Hence, the apostate European churches, using the civil governments as their “enforcers”, became the Mystery Babylon Harlot riding the Beast (picture, left), as spoken of in Revelation Chapters 17 and 18. And as those early centuries progressed, the apostate European churches eventually became the persecutors of Christians. And so began a long 1260 year tribulation (forty-two prophetic months: Revelation 13:5) in which the apostate churches of Europe made life difficult, and sometimes even very bloody for God’s people. At first, many Christians simply kept quiet about their love for the Bible. But as the centuries passed, many Christians had to flee to the European Alps, and begin life anew in the safety of those mountain strongholds. Yes, at first, God’s people simply retreated from society below. But then, in the 1300’s, began the great Christian R eformation. God raised up men like Wycliffe, Huss, Jerome, Tyndale, Luther, and many more, who would fearlessly stand up to the priests and prelates of the apostate Church. Of course, Satan, the ruler of those apostate churches, likewise began his retaliatory attacks against the Reformation; and this went on for centuries. Oh yes, at various times there was peace for the Christians. God mercifully allowed them such intervals of rest. But after some time, the blood of martyrs once again was spilled. And also, the Bible was a much hated book by the apostate churches, and copies were burned, and that Book of books was eventually outlawed. Satan tried relentlessly to obliterate the Bible out of existence. This Protestant reformation continued on, combating these religious and civil authorities, who were torturing, imprisoning, banishing and even killing God’s people, at various times throughout the Dark Ages. But when the 1260 year prophetic time-clock ran out, this first Beast finally received a deadly wound: a deadly wound by God’s glittering sword, the Bible. Listen… “In that day the LORD with His sore and great and strong sword shall punish leviathan the piercing serpent, even leviathan that crooked serpent; and He shall slay the dragon that is in the sea.” Isaiah 27:1. Yes, God’s glittering sword, the Bible, finally delivered a deadly wound to the Dragon in the sea-of-nations, that is, Satan. You see, when the printing press was invented, an underground movement began to publish and distribute as many Bibles as possible. Soon, many printing presses were producing Bibles in mass numbers. At this point, the apostate European churches could no longer suppress God’s Word: the Word they attempted to obliterate from existence was at last going out into all of Europe, delivering this 1st Beast, his deadly wound by a sword (the sword of God’s Word). For those who have a thirst for reading, The History of Protestantism by James Wylie. Another much shorter history might be found in Foxe’s Book of Martyrs. and he had two horns like a lamb, and he spoke as a dragon. At this point, Satan had to employ a new strategy against Heaven. And Satan had a radically different plan this time. And so came the hour for the second Beast to make his appearance on the world-stage. This first Beast received the deadly wound. And so, at the same time that the first Beast was seemingly dying, this second Beast was arising out of the Earth. This second Beast took over for the badly wounded 1st Beast. In worldly terms, you could say it was “a hellish tag-team”! Now why did God even speak of a second Beast? Why did He not just speak of this first Beast? W ell, the answer to this question is quite simple! You see, after his ruthless first Beast received its deadly wound by God’s glittering Sword, Satan knew he had to put an entirely “new face” on his hellish war-machine. The 1st Beast was so ruthless, and had such a horrible and bloody reputation, it was virtually impossible for this beast to have any more favor with society. Not to mention that the Bible was now being read by the great masses in Europe, which only exposed the totally unbiblical doctrines of that apostate church. So an entirely new and different strategy had to be implemented. This new Beast was a “kinder and gentler beast”, as the saying goes. After all, False Prophets have to be nice, to a certain extent. Yes, these two beasts had a vastly different modus-operandi from each other! They had two entirely different strategies to wage their war against Heaven: the first by blood and torture and famine and war. But the second Beast would employ just the opposite: prosperity, materialism, false ideologies and world-loving gospels. The pendulum was about to swing the opposite direction. And Satan was going to make sure it would swing much too far in the opposite direction! Wealth, pleasures, peace and safety, and time-consuming diversions, false miracles in world-loving churches, were just some of the weapons of war which this 2nd Beast, the False Prophet would employ against God’s people in these last days. This above verse lays down an important principle: that neither extreme (riches nor poverty) is healthy. And so, this passage seems to be a hidden prophecy concerning the two periods of the New Testament history. This 2nd Beast was a new and improved beast! No longer did Satan need to kill, torture and banish Christians. Nor did he need to confiscate and burn Bibles. No, this new and improved Beast would simply flood the Christian nations with every pleasure and pursuit, and material good, and false ideology conceivable! (“And I beheld another beast coming up out of the earth;” Revelation 13:11). This 2nd Beast’s power was from the earth! And truly, this beast arose out of the Earth: because earthly Mammon and excess was what this 2nd Beast was all about! And in addition to this, Satan has turned his efforts to persecute God’s people by means of false ideologies and quasi-biblical counterfeits. And with all these, he has flooded the world with every pleasure, pursuit, ideology, and false gospel conceivable. He no longer needs to imprison and torture Christians in man-made dungeons. He would simply flood the world with all the, “lusts of the flesh, lusts of the eyes and pride of life”, to the point that Christians were so preoccupied with worldly Mammon and watered-down prosperity gospels, that they had little time and little inclination to devote themselves to ceaseless prayer, and to the serious study of God’s Word, and to the purification of the heart. Yes, this false Prophet successfully captivated the hearts of God’s people, and greatly stunted the growth of God’s Church, by means of earthly Mammon, and wretched excess, and worldly gospels! “No man can serve two masters: for either he will hate the one, and love the other; or else he will hold to the one, and despise the other. Ye cannot serve God and mammon.” Matt. 6:24. This above verse really encapsulates Satan’s strategy in these last days: to preoccupy God’s people to the point that we are attempting to serve two masters! The story of Balaam was also a picture of the 1st Beast, but also, this 2nd Beast. Balaam could not curse God’s people. What began as a curse, turned into a wonderful blessing for God’s people. And this corresponds to the 1st Beast, who actually made Christianity even stronger because of his physical violence and persecution against Christians. But later on, Balaam told the wicked king of Moab to send in prostitutes in the Hebrew camp. And this strategy proved effective in placing a curse on God’s people. So it is with this 2nd Beast. Because all the persecution and bloodshed by the 1st Beast, only strengthened the Reformation and God’s people. But this 2nd Beast is using Balaam’s strategy of bringing in spiritual harlotry, in the form of earthly Mammon and various and many worldly compromises into God’s camp. And this proved far more effective in the deterioration and ultimate destruction of the church-world. So when the 1st Beast of Revelation received his deadly wound, then churches no longer suffered persecution. The great tribulation had ceased! No it didn’t stop! It just changed! Not only did Satan’s persecution change in form, but also in location! Yes, Satan and his fellow evil angels packed their bags, so to speak, and moved to the New World, which was rich in natural resources: the perfect place to serve as headquarters for his new assault against, not only God’s people, but also against the whole world! And, as already stated, Satan had simply changed his modus-operandi. Now when Satan came as the 2nd Beast, the False Prophet, and began filling society with every conceivable pursuit: various pleasures, inventions, material goods, television/Internet/radio, clubs, sports, hobbies, ideologies, careers, resorts, prosperity-churches, and every other diversion he could possibly create. Yes, all these seemingly innocent pursuits and pleasures and pastimes would be used by this False Prophet to divert God’s people from a 100% devotion to overcoming Satan’s world. And so, even though the physical persecution had ceased, a far greater persecution had begun. Satan merely stopped all violence to Christians and to the Bible, and instead, created an atmosphere of “peace and safety”. And by so-doing, he did what the 1st Beast could not accomplish. Satan, by this 2nd Beast, also called the False Prophet, had created an atmosphere which completely put the Church at ease. Another abomination which entered the Church during the early 1800’s was the so-called “Free-Will” gospel. It was first conceptualized by Jacobus Arminius (picture left), but Charles Finney (picture right) really started the ball rolling in this movement, but was followed by many others. This totally unbiblical doctrine was based on the idea that humans have free-will to choose to serve God or Satan. Of course the Bible never ever teaches that lost souls have free-will. Just the opposite! And so it is here revealed that true repentance is the gift of God! Man cannot conjure up repentance of his or her self! And this truth stands in stark opposition to the “free-will” gospel, which believes that there are certain persons who possess enough innate goodness to choose Jesus, while others do not. This totally hopelessly lost condition was the state of Paul when God gave him a new heart. And it is the lost and hopeless state of all mankind! And so, Salvation must be given as a gift. Nowhere in the Bible does it say that men have “free-will”! That was lost when Adam & Eve chose to disobey God. And it is only by receiving the gift of a “new heart”, that a sinner can receive repentance, thus becoming saved…. One of the abominations that came forth from this “free-will” gospel, is that it created the idea that because, “I chose Jesus”, therefore I can remain in my semi-diseased condition. But the evidence that a man, woman, or child has truly become saved, is that they dedicate the remainder of their earthly life to being fully engaged in heart purification! Listen… “And every man that hath this hope in Him (of meeting Christ in peace), purifies himself, even as He (Christ) is pure. There are many who have been deceived by this “free-will” gospel, placing their trust that because they responded to an altar call, or said “The Sinner’s Prayer”, or were water-baptized, that these human works saved them. But only those who seek after the Lord’s holiness on a daily basis, give true evidence of Salvation. And so, during the so-called, “2nd Great Awakening”, revival, this “Free-Will” doctrine became the progenitor of many unbiblical doctrines, which also gendered many unbiblical ministries. Now, to avoid naming any of those organizations, let it just be said, that the Bible lays down the model of proper ministry. Such books as Acts, and the other books and epistles of the New Testament define just how we are to evangelize the world. And as we look around today, we can see that there are many specialized ministries, which combine secular and worldly elements with Christianity, to form a sort of do-it-yourself gospel, based on the premise that we humans have the power to save souls by our own efforts. But this “free-will” gospel became a man-centered force in which the focus was now on various evangelists and their charismatic charm and abilities. And the thinking was that God’s grace would meet man’s free-will at some middle ground. And as a result, such things as “altar calls”, and “The Sinner’s Prayer”, and loud preaching, joking, and an obvious air-of-arrogance, which brought multitudes into the Church who were still unconverted. But the thinking was, “Well once they get into the pews, then we can convert them”. And so, with this in mind, the rest of this article explains what has happened to the Church, since this 2nd Beast, the False Prophet, has been doing his deadly dance with the Church. So please read on, and let’s remember that the Church is not the “bad guy”. Satan is the “bad guy”. Satan is the true Abomination of Desolation. And we have all been deceived to a great degree. So none of us can throw our, “holy rags around us”, and point the finger of indignation at anyone else! As Paul so aptly stated… “This is a faithful saying, and worthy of all acceptation, that Christ Jesus came into the world to save sinners; of whom I am chief.” 1st Timothy. Paul correctly saw that his own heart was as wicked and deceitful as any other. But he said, “this is a faithful saying, and worthy of all acceptance”, meaning that you and I can likewise make this same statement about our own wicked hearts! Perhaps it’s time to take a short pause from this discussion of the Abomination of Desolation, in order to lay down a basic principle about Bible interpretation. There are many things in the Bible, which are clear as noonday; The deity of Jesus; His death on the Cross; the call to repentance; judgment to come. These are just some of those biblical concepts which God has stated plainly in Scripture. And God has made the way of Salvation clear enough, so that none need stumble. But there are many other concepts which are not so easy to see. The above verse from Psalms is a prayer for understanding what Scripture refers to as, “Hidden Manna”, that is, enshrouded Bible truths, which are like precious gem-stones scattered and concealed between the lines in God’s Word, just waiting to be discovered… “Open Thou mine eyes, that I may behold wondrous things out of Thy law.” Psalm 119:18. And so, this verse reveals that there are certain Bible truths which are hidden, which only God can reveal, if He so chooses. But why would God do this? Why not just write these truths in such a way that makes them plain to understand? Well, the answer to this puzzling question is found here in several passages which address this subject. First, Proverbs makes this statement… “It is the glory of God to conceal a thing: but the honour of kings is to search out a matter.” Proverbs 25:2. Since Scripture makes clear that we are kings (see Revelation 1:6), then God is speaking to Believers, as kings, who search out what God has concealed. The second reason why much of the Bible is hard to understand, is found in Jesus’ words as to why He spoke in parables… “Therefore speak I to them in parables: because they seeing see not; and hearing they hear not, neither do they understand. And in them is fulfilled the prophecy of Esaias, which saith, By hearing ye shall hear, and shall not understand; and seeing ye shall see, and shall not perceive:” Matthew 13:13, 14. The deeper truths of the Bible will not be understood by many, simply because God has hidden many truths within parables and allegories. Third, as already mentioned, Peter declares… “As also in all his epistles, speaking in them of these things; in which are some things hard to be understood, which they that are unlearned and unstable wrest, as they do also the other scriptures, unto their own destruction.” 1st Peter 3:16. There are many who are unlearned in the Scriptures. But just who are the unstable? Well, listen to James… “For let not that man think that he shall receive any thing of the Lord. A double-minded man is unstable in all his ways.” James 1:7, 8. And so, some of the concepts in this article are those which are not readily seen in the Bible. But by comparing spiritual things which spiritual, these difficult truths may begin to shine upon our upward heavenly pathway. But let not those who are double-minded, think that they will discover these deeper truths! Because, as these passages point out, those who are still seeking after the things of the world, have not yet entered in to God’s Everlasting Rest. HOW CAN YOU SEE SATAN? But back to the subject of the Abomination of Desolation. The big problem is, how can we see Satan? After all, it says, “When ye therefore shall SEE the Abomination of Desolation” How can you SEE the Abomination of Desolation? After all, Satan is an invisible spirit being! He is described as “Prince of the Power of the Air”. Just listen… “Wherein in time past ye walked according to the course of this world, according to the Prince of the Power of the Air, the spirit that now worketh in the children of disobedience:” Ephesians 2:2. Now during the Dark Ages, it was easy to see Satan. He came through the Antichrist people of the world-loving churches, as they controlled the civil authorities to persecute God’s people. It was very easy to see demon-possessed men and women as they, “came out with swords and staves”, to destroy God’s people. After all, they were burning both Bibles, and Christians too! And they were torturing many in dungeons. So it wasn’t so hard to know just who one’s enemies were! But in the 20th Century, it was not so easy to see Satan. God’s people were no longer being physically persecuted as was the Church during the Dark Ages (except in Muslim nations, of course!). Both the churches and societies now had a form of godliness (see 2nd Timothy 3:5). Christians now were enjoying peace and prosperity, to a great extent. But if we examine the above Bible passage from 2nd Thessalonians, we find the answer to this dilemma. It says here that “And then shall that Wicked be revealed“. OK, so now it becomes apparent that this Abomination of Desolation will be performing “all power and signs and lying wonders”. Now here is something we can see! And tie this passage together with this next one… “For there shall arise false Christs, and false prophets, and shall show great signs and wonders; insomuch that, if [it were] possible, they shall deceive the very elect.” Matthew 24:24. Now we are beginning to get a picture of how the Abomination of Desolation was revealed. And never before in history, had there ever been a time in which the apostate churches were performing signs and lying wonders as they were in the Twentieth Century. Never before in history, did we read of any world-wide movement of signs & wonders as we were seeing in this 20th Century generation. And the more lawless and apostate that congregation was, the more interest they had in signs and wonders. Or so it seemed. There are many who are jealous for their own congregation…and rightfully so! They know so many faithful fellow-members, and even witness new-comers being baptized, and proclaiming a new life in Christ. So how in the world could God not be working mightily in their congregation? Well, the above verse reveals that false prophets will, if possible, deceive even the very elect. Notice in the above verse, that the words, [it were] are in italics, and so these two words are supplied words by the King James Bible translators. It should actually read… “if possible, they shall deceive even the very elect.” Now obviously none of the truly Elect will be deceived to the point of losing their Salvation. But on the other hand, false prophets may deceive the very Elect into believing that these lying signs and wonders are from God. Yes, during the era of the congregations, Satan may have given compelling sermons. He may have caused people to give up bad habits, or to give generous o fferings, or even to behave differently. Satan had the ability to perform, “ALL power, signs and lying wonders”. In other words, Satan had the ability to completely counterfeit every aspect of Christianity. He even had the power to create religious excitement. He had the power to compose wonderful sounding worship songs. He even could present uplifting Bible studies. He had “ALL power, signs and lying wonders”. This Revelation 12 Woman Constellation is fleeing. As you can see, the Dragon Constellation is spewing a flood of water in her direction, as is written… “And the serpent cast out of his mouth water as a flood after the woman, that he might cause her to be carried away of the flood.” Revelation 12:15. This wave of water represents Satan’s lies, and his false teachers who tell those lies. So this passage (and others too) equates flood waters with the sorrows of Hell, with ungodly men, and with waves of death. And so then, by comparing Scriptures dealing with flood waters, it begins to be seen just what this Woman of Revelation 12 is fleeing from, as she flees from the water which the the Dragon is spewing. And so, by looking at various related Scriptures, it becomes clear just what this wave of water represents. This Revelation Ch. 12 Woman is fleeing from ‘waves of death’, from ‘sorrows of Hell’, and from ‘floods of ungodly men’. Just listen to Isaiah… “When the enemy shall come in like a flood, the Spirit of the LORD shall lift up a standard against him.” Isaiah 59:19. So the Bible very quickly unlocks the hidden meaning of the word, “flood”. But exploring the word, “water”, it is found that water represents the cleansing God’s Word. Now what does this have to do with the Dragon’s floodwaters? Listen…“And the serpent cast out of his mouth water as a flood after the woman, that he might cause her to be carried away of the flood.” Revelation 12:15. Notice that all of a sudden, this Dragon is referred to as the “serpent”. Here is a reference to the Garden of Eden, when Satan came as a serpent, and deceived the woman with his words. And so this wave of water coming from the mouth of the serpent has to do with deception. After all, what else but lies and deception could come forth from Satan’s mouth? Oh yes, Satan often cloaks his lies in much truth. But as we all know, the best lies are usually made of 80% or 90% truth. So God’s Word cleanses, but Satan’s words deceive. And this wave of water represents all the ungodly, whom the Devil uses to bring false doctrines and temptations, in hopes of sweeping God’s people away in his floodwaters. “These six things doth the LORD hate: yea, seven are an abomination unto him: 1. A proud look, 2. a lying tongue, and 3. hands that shed innocent blood, 4. An heart that deviseth wicked imaginations, 5. feet that be swift in running to mischief. 6. A false witness that speaketh lies, and 7. he that soweth discord among brethren” Proverbs 6:16-19. This description almost sounds like your typical Hollywood movie, doesn’t it? And to a great degree, these are the qualities which govern the people of this world. Do we even need to explore these qualities? Is there any doubt that this world loves pride? Pride of dress. Pride of houses and cars, and careers and credentials? Yes, pride is a very important quality of this world. And that’s just the first quality mentioned here! So it sounds as if we’re simply talking here, about a worldly-minded person. But when God says, “SIX things doth Lord hate: yea SEVEN are an abomination unto Him”, God appears to be hinting, by using the number “seven”, that He is speaking of an unconverted person WITHIN the Church! This is because the phrase “Six things doth the Lord hate” is pointing to Mankind whose number is “six” (“So God created man…And the evening and the morning were the SIXTH DAY.” Genesis 1:27, 31). And as a further evidence, just look at what is the 7th thing mentioned… “he that soweth discord among brethren”. Right here, God has hidden the key to the understanding of just what is the Abomination of Desolation: “he that soweth discord among brethren”. This is the 7th thing that God hates. And of course, it’s dealing with “among brethren”. And this 7th Abomination has to do with sowing discord “among brethren”. It is those wolves in sheep’s clothing who have entered God’s sheepfold, and are “among brethren”, leading these unsuspecting brethren astray. These qualities are what comprise this Abomination of Desolation. Doing a word search on the word, “abomination”, it is quickly discovered that God’s people were not to eat unclean beasts which were an abomination to God. Listen to Scripture… “And every creeping thing that creepeth upon the earth shall be an abomination; it shall not be eaten.” Leviticus 11:41. God speaks of various types of unclean beasts, fowl, and creeping things, as abominations, just as this above verse does. But what do unclean beasts have to do with the Abomination of Desolation? The New Testament, whenever it speaks of unclean beasts, it is made clear that God is referring to unbelievers. Listen to Scripture… “Be ye not unequally yoked together with unbelievers…Wherefore come out from among them, and be ye separate, saith the Lord, and touch not the unclean [thing]; and I will receive you…” 2nd Cor. 6:14-18. Notice it says concerning unbelievers… “come out from among them (unbelievers) and touch not the unclean [thing]”. And this is seen throughout the New Testament. The Bible in both the Old and New Testaments refer to unbelievers and false brethren as unclean beasts. Listen once again… “come out from among them (unbelievers) and touch not the unclean [thing]”. 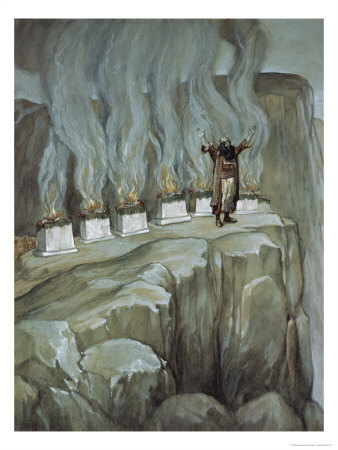 “[Mankind] Professing themselves to be wise, they became fools, And changed the glory of the uncorruptible God into an image made like to corruptible man, and to birds, and fourfooted beasts, and creeping things…Who changed the truth of God into a lie, AND WORSHIPED AND SERVED THE CREATURE…Being filled with all unrighteousness, fornication, wickedness, covetousness, maliciousness; full of envy, murder, debate, deceit, malignity; whisperers, Backbiters, haters of God, despiteful, proud, boasters, inventors of evil things, disobedient to parents, ETC…” Romans 1:22-32. So this is how God sees His people. These are the qualities which exist in the Man’s heart. As one goes through this litany of various sins, it becomes clear that these qualities often times surface in the Christian’s own behavior as well! “My” own behavior may be an abomination in God’s sight, when engaging in such ungodly conduct. But notice that God makes this statement about Mankind’s character, because lost Mankind “serves and worships the creature, instead of the Creator“. And if one thinks about it, animals possess many of these same attributes listed in the above Bible passage. Now they are dumb animals. Animals have an excuse for their bad behavior. But humans don’t have an excuse for such animalistic behavior. Man was created in the image of God. And especially we who are of the Household of Faith, have no excuse for such animalistic behavior. For instance, when we “bite and devour one another” (Galatians 5:15), are we not acting like the beasts of the Earth? Now as to the matter of unbelievers and false brethren in the Church, the Apostle Paul puts it this way… “For I know this, that after my departing shall grievous wolves enter in among you, not sparing the flock. Also of your own selves shall men arise, speaking perverse things, to draw away disciples after them.” Acts 20:29, 30. So isn’t it amazing that Scripture has this thread running through and through, concerning false brethren in the Church being called unclean beasts? And so does this above verse from Acts! Paul here refers to these impostors as wolves…grievous wolves! And of course, a wolf is an unclean beast, and is an abomination to partake of, even if he does come in sheep’s clothing!